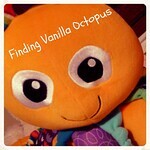 Finding Vanilla Octopus: When Will This Tooth Come In? Why is it five o'clock when I hear a scream? When the nursing's all done it's around 6:15. I hear the footsteps falling on a different floor. And when they've woken, my day begins. Up until lunch she's cranky and tired and clinging. Snuggling helps, but only if she will stay. We must last until nap or we'll have a worse day. Sit with her on the floor. It seems the only way I can win. Of sleepless nights like I had that first year. When she napped with a smile?